Well my parents have left after their month stay and we miss them tons!!! My Mom is amazing and helped me to get so many things accomplished. One of the biggest ones is after 4 days of hard labor my Mom ( she is amazing!) and I transformed the kitchen. We took off the doors , cleaned them, sanded everything, painted,replaced hinges and added hardware, then finally added a spray of polyurethane for protection. I knew it would look sooo much better but I am still amazed at how great of a change. Here is a before and after shot. So now that we are all done and my parents have left to go back home, I was able to set up my sewing space which is in the extra bedroom. We decided to put in a King bed so that my parents could come and stay with us so I don't have as much space as I was hoping for but it is worth it to have my parents able to come and stay. I have accumulated alot of fun stuff that I can finally showcase! It is great to finally show off some of my work and things that I have received in swaps and from friends. The sewing community is great! On the same wall as my desk is the closet which I have put all of my fabrics. 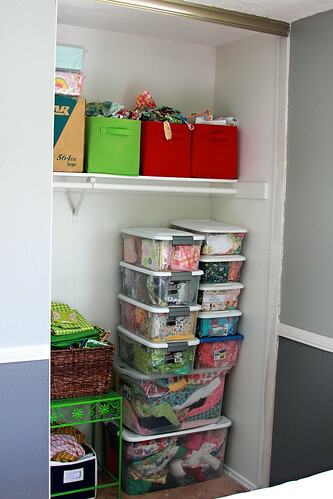 I have always kept my fabric in storage bins since they have needed to be stored in a closet or under a bed but now that I have some space I am deciding if I want to keep them in bins or get shelves for the closet and pull out the fabric and display them?!?!? Thoughts??? If you turn to the right of the closet on the next wall is the King size bed pushed up into the corner along with the window which I made the curtains for while my mom was here out of Echino fabric. This bed is getting a new quilt for it from my 2 bee's that I am in. 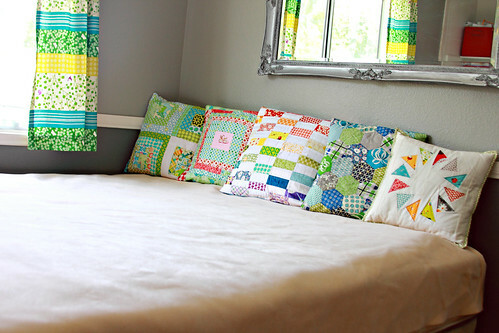 I am having everyone in June (which is my month in both bees) make me blocks that I will sew together for this bed. I can't wait! While I am waiting the bed needed something so I brought in pillows to brighten it up. Here is the bee fabric I am sending out. I am very excited to get back to sewing and having some space to do so that is not my dining/kitchen table which is where I have been sewing all these years. omg, I just adore this whole display! I just put up my own inspiration board behind my cutting table and am having so much fun filling it up. Where did you get that little chair? I must have one! Lovely---I have my own space too now and LOVE it sew much!!! Just shut the door and it disappears! love love love it! it looks so pretty! Wow your kitchen looks amazing. The darker cupboards make it look really modern. With regards to storing fabric I store some away but like to have my latest fabrics displayed in baskets which I find inspiring to have around when I'm creating. Just have to keep them away from direct sunlight though. Everything looks wonderful! 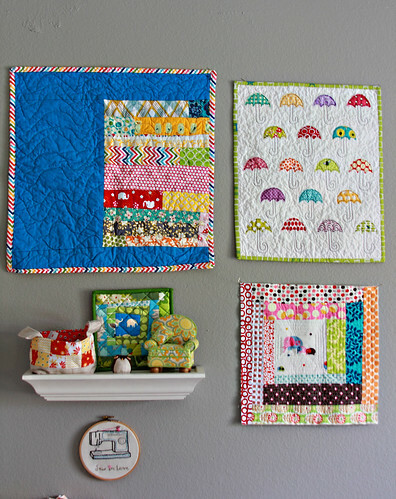 How did you hang those wall quilts? I don't see anything holding them up! The kitchen looks so different! 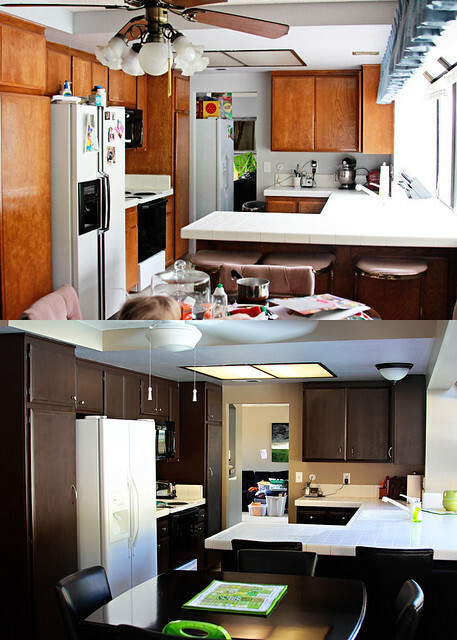 I need to redo my cabinets in hopes of a similar transformation! I love your new sewing area, and those curtains! They're so fun! love the kitchen re-do! Wow. So you just painted them dark brown? Amazing. The kitchen looks great! Looks like you got a new fan & chairs too, right? Lovely! Your kitchen really amazes me! I really want to do something like that to my cupboards in my bathroom. i got a shoe bin kinda thing at Lowes that is wood and i hung it on the wall. it is perfect for FQ's and deep enough for yardage. can't w8 to see what you come up with! Can you tell me what you used to do your cabinets? 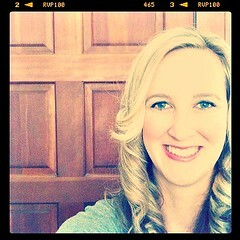 Mine look worse than your before pictures and I really need to make a change to them!! I love your new look in the kitchen and the cute sewing space you have! The pillows are beautiful on the new king bed. I bet you made them. It sounds like it was so much fun for your mom to be with you and finish all those projects. It all looks amazing. The colors all go so well together. 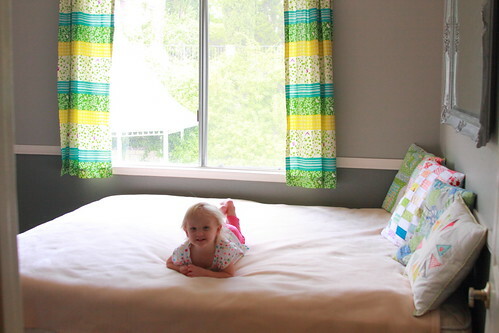 Hi Darci..just caught up on this one..I really like that Echino fabric made into curtains. I adore your row of cushions too. Your kitchen is amazing!! 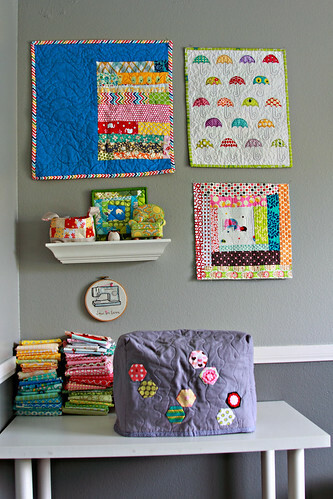 And I LOVE what your're doing with you sewing room. Adorable stuff on the wall;) It really makes me want to get my room set up and organized so I can actually work in it, I have WAY too much stuff, but SOON, very soon! !